O’Reilly's Rainforest Retreat offers four star accommodation in the World Heritage listed LamingtonNational Park in the Gold Coast Hinterland. Owned and operated by the O'Reilly family for three generations, it has become legendary for providing quality Australian hospitality in a naturally diverse rainforest setting. The retreat is a nature lover’s paradise, with an emphasis on ecotourism. It offers a comprehensive discovery program of guided and interpretive activities as well as the Treetop Walk, which provides a unique Birdseye view over the rainforest canopy. The retreat has a range of accommodation options, from Garden and Mountain View Rooms through to Canopy Suites and Mountain Villas. Garden View Rooms are motel-style rooms featuring red cedar shutters, hand crafted Queensland Maple furniture, queen beds, en-suites and views of the gardens around the guesthouse. Mountain View Rooms boast a private balcony where you can relax and soak up the magnificent views to the McPherson ranges. These rooms feature exposed beams, natural timbers, raked ceilings and private bathroom. One Bedroom Canopy Suites adjoin the luxuriant rainforest canopy and offer twice the space of Mountain View Rooms. The suites have four large balconies with spectacular views of the rainforest foliage and western mountain ranges. A spacious bedroom features a king-size four-poster bed, sofa and a fireplace. 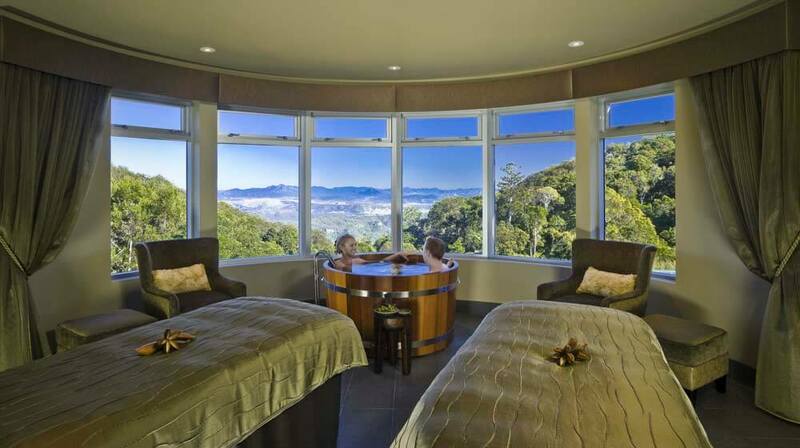 The bathroom has a spa bath with views through a full-length picture window of the breathtaking mountain scenery. Two Bedroom Canopy Suites feature two bedrooms, a separate living room and two way fire place. 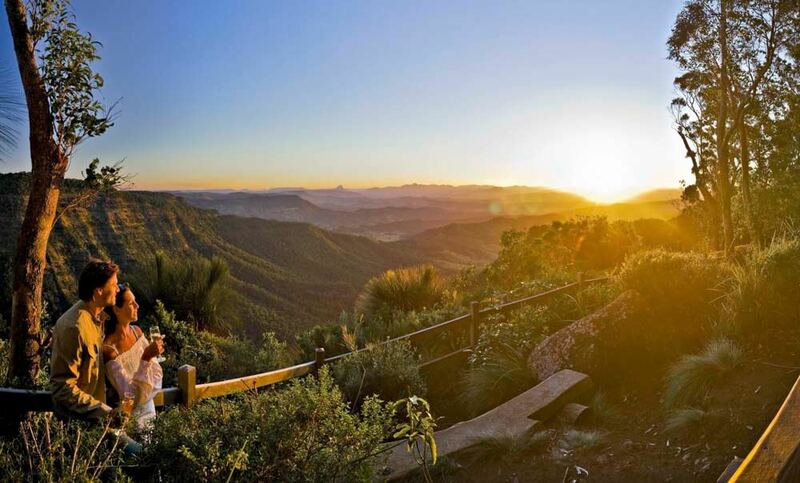 The large decks, complete with a private spa bath, look out onto the rugged McPherson Ranges to the west. Polished timber floors, cedar shutters and handcrafted furniture complement the warmth and character of these suites. One, Two and Three Bedroom Mountain Villas are set amongst a spectacular rainforest and mountain setting. Each villa is fully self-contained with full kitchen and feature modern designer decor interiors opening onto expansive private decks with outdoor spa bath and barbeque. Extensive use of natural timbers and large fold-back doors provide a design where the natural surroundings flow into the living space and connects with the interiors. All bedrooms have their own bathrooms and each villa has undercover car parking. The retreat’s restaurant serves hearty meals and is open daily for breakfast, lunch and dinner. Packed lunches are available for those wishing hit the trails and spend the day exploring nature. The O’Reilly’s Lost World Spa, named after the rugged wilderness area to the southwest of the retreat, embraces the natural elements of the surrounding environment, offering a chance to be nurtured amongst nature. We recommend pre-booking any treatments to avoid disappointment.